Day 1105 - Saturday and Farewell February! It's Saturday, and 'March Eve'... February certainly flew by! 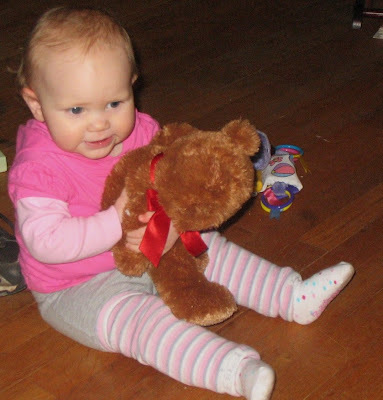 Here's another cute picture of Savannah with her dance partner, the bear. I'll be there in a few days, Savi! Today I'm off to water aerobics, like usual, then shopping. I might go back to Trader Joe's today. I'd also better increase my focus on packing for my trip next Thursday, can't wait, can't wait, can't wait! Day 1104 - Friday, Hooray! Hey - it's one more week till Savi's birthday! Yay! I'll be there! Did you see the latest three American Idol contestants who are going through to the top 12? I really like two of them, Allison and Adam. Allison is only 16 but has a BIG voice! Hey - february is almost over too, seems like february always goes by fast because it's a short month. I'm going to make this blog short too, because I need to go in early and try to figure out a problem. TTFN and have a great Friday AND a great weekend! Day 1103 - Thursday and Survivor night! 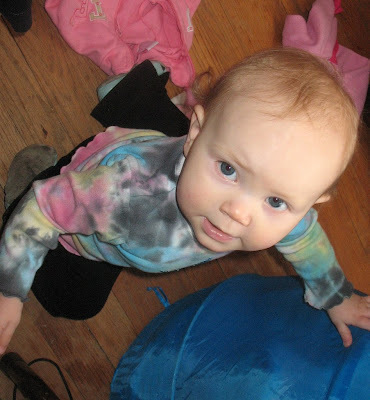 Check out sweet Savi looking up at us! Can't wait to see her in just over a week. 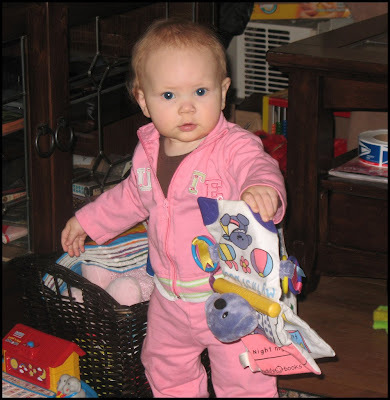 We are ONE week plus ONE day away from Savannah turning ONE! (Next Friday). Sooooo - what's going on? I had strange dreams last night, and I'll tell just a few details that I remember. First - in MY dreams I usually have some kind of challenge or navigation issue. I was on a vacation and had a room at this country cottage-motel kind of place with a grassy lawn on a bluff. The people were so thick on the grass that I had to walk very close to the cliff edge to get by, stepping over people. When I got to the front desk, the route to my room was also blocked, because they had set up a food bar/buffet there. I decided to go back outside and around the building, but a kind staff member let me through. Walking down the hallway to my room, I passed another staff member who was hanging up a photo next to her cash register. The photo was of a character (Inquisitor Glockta - an interrogator who was a former P.O.W. and heavily tortured) who I have been reading about in the trilogy I am reading right now. It is very rare for me to incorporate a character from a book I am reading into my dreams, by the way! Last bit - there were two bonfires on the beach that nobody was really tending, and sparks and twigs (sticks, actually) were flying from it that I was concerned would start a fire in the beach grass, etc. Well, I think that's enough blathering about my dream last night - I have to go!! TTFN! I'm running late this morning, so this will be quick. Charlie's got a date this morning with Marcy Jo. Uh, that means Marcy Jo's Meal House restaurant. Charlie and his buddy are going there for breakfast, then going fishing (or floating) on the Elk River. Charlie was already talking about what he might order for breakfast. Do you ask yourself 'What am I in the MOOD for?' when it comes to dining out? I do! Even when I'm making supper, I think about my options and pick the most appealing one. Speaking of options, Charlie and I went to check out a new supermarket superstore named 'Kroger Marketplace' on Sunday- looks like a combination of a grocery store, Target, and Pier 1 Imports. They even had some furniture items and office stuff for sale. They had THREE (count 'em), THREE different varieties of sweet potatoes, so I could get regular ones, the white variety, or the Oriental red ones. (I got both regular and red oriental ones). They also had a mediterranean olive and marinated food bar, and all types of premade salads including couscous and fat free pasta salad. Gotta go! I'm late! Bye! Greetings, Bloggy Fat Tuesday Celebrants! Yup, today MUST be Fat Tuesday, and tomorrow should be Wide Wednesday, followed by Thick Thursday and Flabby Friday? Hmmm - positive self-talk, Karen. The news footage of Mardis Gras in New Orleans looks fun - Val Kilmer is the King this year, and I like him too. I especially liked his role in 'Willow'. 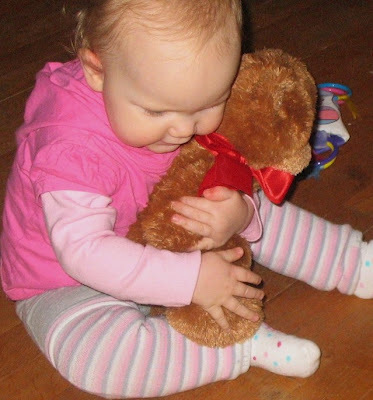 Look at this adorable picture of Savannah hugging her bear! That's a real bear hug! I just love that photo! Good work, Heather! 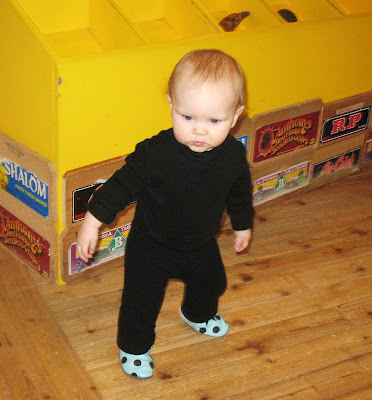 I really like Savi's dance outfit - especially the stripes and polka dot combo going on there! Well, I have a 'blah' for ya. I took out last years tax return for an example. I calculated sales tax, property tax, mortgage interest, charitable contributions, blah blah blah. Well, they have a point, but when you are used to getting a refund, it stings. Ah well, I hope YOU have a nice Monday while I feel sorry for myself. I don't think I'll be sending in my return until the very last day. Hey dudes and dudettes, what's yer sign?? 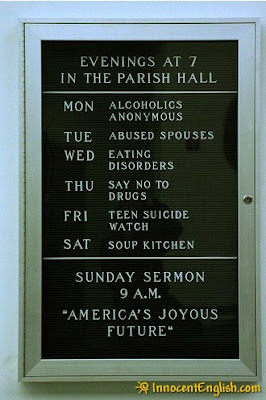 This is a real sign from a Catholic church somewhere in the U.S. This is hilarious!!! Thanks to InnocentEnglish.com for the photo of the day. Did I tell you I saw a whole calendar of church signs when I was Christmas shopping? They exist! Well - we'll be heading out soon to go swim, then home, then Home Depot to look at roof shingles, then to a new 'Kroger Marketplace' store that has opened recently. I don't know how the weekend came around again so fast, but I'm glad it did! I am off to water aerobics this morning, then back home, then off again to run errands. I have already taken out a suitcase and started to pack for the next Birthday celebration - Savannahs, in two more weeks. I AM GOING TO DO MY TAXES THIS WEEKEND. Day 1097 - Happy Birthday, Heather! Here is the fanciest home-birthday-party cake I've ever seen, my friend Daphne assembled and decorated it for her 1-year-olds birthday. Heather's favorite cake (as far as I know) is chocolate cheesecake. Better drive to Greggs, Heather, and get some! Heather's favorite restaurant? Probably the Nordic Lodge! I mailed Heathers card at the post office on Monday (which was a holiday) - I hope it arrives today! One of my favorite 'Heather' stories is when she 'lost' her eyebrows... Tell us more! Tell us more! 'Mom! Mom! My eyebrows are gone! ', Heather wailed one morning. Upon closer inspection, her hydrogen-peroxide-based face cleansing routine had bleached her eyebrows so light that they couldn't be seen. She had to clean around her eyebrows after that. I've always wanted to send that story to Readers Digest, I would think they'd buy it. Happy Birthday, Heather! I'll see you and the girls in two weeks! Greetings, Bloggy Can't Wait for the Weekend-ers! I told Charlie this morning that he was 'shaving at the speed of retirement' (meaning slowly). He knows I'm just jealous, and I admit it. However, the stock market might very well have nipped my early retirement plans in the bud. *sigh* I don't open my statements, and haven't since the market tanked. That means I don't know how poor I really am! Ha! HEY - what is UP with the price of oil being so low and gas prices RISING? What the &^%$? Gas ought to be 99 cents a gallon instead of twice that. Someone is screwing us over. Gripe gripe gripe. Anybody seen any good movies lately? Was 'Taken' any good? Gotta go - talk among yourselves via the comments. TTFN! Where does the time go? It's Wednesday already! Gee, Savannah seems to be wearing a good bit of her lunch (or dinner) - thank heavens for washing machines. Speaking of washers - I heard a commercial yesterday for a washer/dryer set, and they said you could wash and steam dry in 36 minutes. Holy smokes, Batman! They are made by Electrolux, and feature a wash or dry cycle for small loads of 18 minutes, start to finish. I just looked it up... Good grief! They feature a 'favorites' setting like your computer or phone. Day 1094 - Happy Birthday, Lyn! The darling twosome in the photo is me, in red, and my sister Lyn, in white. I love that white sweater! We won't tell which one, but it's a BIG one. I am sure my card got there in time, because I mailed it with my valentines. We're on a boat going somewhere - Mom - do you remember where? 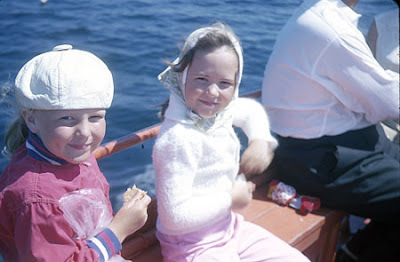 I probably munched on crackers the whole time to keep from getting seasick - I didn't know about ginger capsules back then. I think it's also our cousin Chip's birthday - we have such a big family that two of my aunts have the same birthday, and several cousins have the same birthday. "3rd Rock from the Sun" actor Joseph Gordon-Levitt (1981), socialite Paris Hilton (1981), actor Jason Ritter (1980), "Crossing Jordan" actor Jerry O'Connell (1974), country singer Bryan White (1974), Green Day singer Billie Joe Armstrong (1972), actress Denise Richards (1972), R&B/jazz singer Chante Moore (1967), basketball legend Michael Jordan (1963), comedian Larry the Cable Guy (1963), actor Lou Diamond Phillips (1962), Celtic singer Loreena McKennitt (1957), actress Rene Russo (1954), NFL running back-turned-actor Jim Brown (1936), "Home Improvement" star Richard Karn (1956), Irish actress Brenda Fricker (1945), Connecticut born singer Gene "The Rockville Rocket" Pitney (1941), television actress Mary Ann Mobley (1939), stage and screen actress Christina Pickles (1935), Into the Wild actor Hal Holbrook (1925), and actor Arthur Kennedy (1914; d. 1990). Wow! Gene Pitney, Paris Hilton, Michael Jordan, and Larry the Cable Guy??? Talk about diversity!!! Have a great birthday, Lyn! TTFN! Day 1093 - Monday AGAIN! Happy Presidents Day, but I don't get the day off so it's not a big deal in my book. In case you haven't figured it out, I was away this weekend and had pre-written all the blogs from Friday through Sunday. I love to be able to do that. 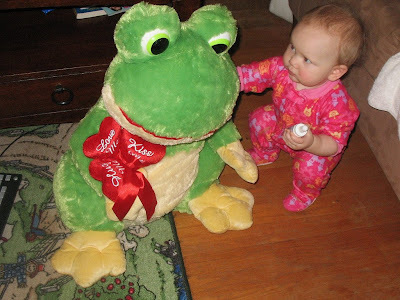 Here's our Valentines darling, Savannah, and her buddy the frog. Isn't this picture adorable?? She is really studying the frog to decide whether she trusts it or not. I love her expression! Speaking of adorable pictures - I received TWO photo collages (with pictures) from Heather this weekend! Awesome! Thank you, Heather, I love them! I might bring one of the collages to work for all the Savi-fans in the office. Right now though I have them both in the den. No updates yet on our roof situation - we'll keep you posted! TTFN! Day 1092 - Valentines plus one! 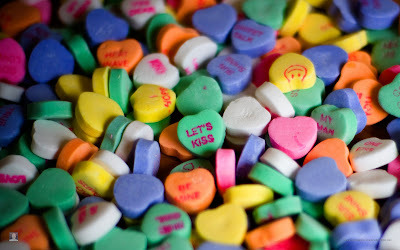 Just a 'drive by blogging' here - I hope you had a nice Valentines Day! Church sign of the day - the best vitamin for a Christian is 'B-1'. Ha! Apologies for the ultra-short bloggage, I'll make it up to you! Day 1091 - Happy Valentines Day! Are you doing something special with your (fill in the blank here - honey, children, boyfriend, girlfriend, or PET) special someone? Also - tell ME some stories in the comments. How about your WORST love vs. your BEST LOVE? How about your strangest date or date related moments? Or the obscene phone caller that I convinced to MEET me so I could get a look at him? I could have been murdered! He was EXACTLY what I had envisioned, poor thing. Or the guy who gave me the eye one day while driving by... We went out for breakfast after our 'connection moment' , and HE HAD MY SAME BIRTHDAY! I never saw him again, by the way. The bright yellow of the box behind her makes her outfit even more spectacular. Sorry - got off subject. We had some very high winds and storms the day before yesterday, you might have seen it on the news. Yesterday morning we went outside to see bits and pieces of roof shingles on the ground. Yes - pieces of OUR roof shingles. We've called the insurance company, who sent a roofer out for an inspection, and he took pictures and sent a crew over to cover up the damaged areas so additional rain can't get in and cause more damage. Next visitor will be the insurance adjuster, and then we can decide what color shingles they will put on when they repair or replace the roof. Day 1089 - Survivor Starts again! The 18th, count 'em - 18th season of Survivor Premieres tonight. We'll be watching! Even wikipedia knows about it. I am running LATE again - sorry about that! We are going away for the weekend Valentines weekend, and I am starting to gather stuff together instead of writing the blog. Please feel free to complain in the comments - that's what they're for. I started looking for a picture to put on the blog this morning, but noticed the time and figured y'all can live without one. I'm just a slow poke today. Just call me Ms. LAST. Do you ever feel like you're LAST, all of a sudden? I'm LAST, LAST, LAST. I'm the LAST car in the pack when driving. The LAST two cd's I bought, I liked the LAST song and have to keep punching the button to get to it. How did THAT happen? The LAST one to hear the gossip at work. 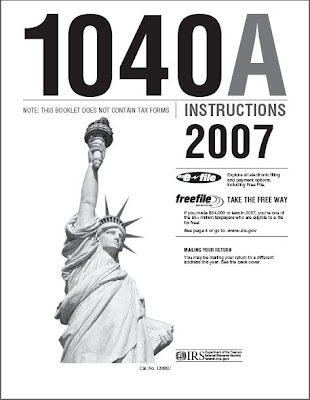 The LAST one to have my taxes ready. (I know that's not true, it just fits my blog topic). I hope you're FIRST at something today! Hope I am too, for that matter! It's already 6am so I'd better hurry up. No, I didn't work on my taxes this weekend. Charlie's cold is getting better but he's still going through the Puffs Plus Lotion, or toilet paper -whichever is closer. Hey! If you need to get Valentines in the mail, better do it now! I mailed mine on Sunday. It's going to be windy and rainy today but continued warm. I'll take it! I hate to wear a coat. I'd better get going - have a nice Tuesday everyone! Day 1086 - No coat today! 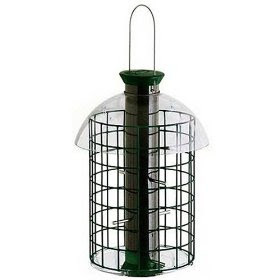 We bought a new birdfeeder recently that looks a little like this, except ours has a metal top. We also bought a thistle sack for the goldfinches. The birds are so happy - I think we had every backyard bird for miles in our yard yesterday. I love to hear their chatter and see them 'line up' on the tree limbs to wait their turn at the feeders. We've had beautifully warm weather the last couple of days - what a difference from bitter cold and having to wear a coat! I will leave soon for work - no coat required. It will be around 70 in the afternoons for a couple days more, than cut back to 50's during the day. I can stand a Monday when it's going to be an 'early spring' type of day. By the way - I put my spring wreath on the front door yesterday to celebrate. Day 1085 - Sunday already! Here's our little blessing, Savannah, keeping the puppies at arms length. We have had various dogs and cats over the years that had puppies and kittens. I never thought I'd hear Heather say 'Only one puppy left to go! 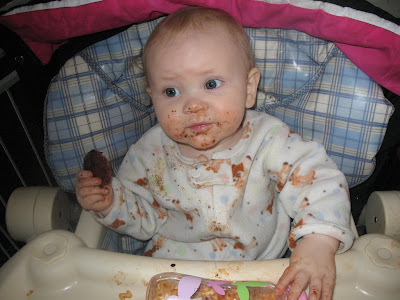 They are so messy!' Heather, you sound just like me or your grandmother. Funny how the perspective changes from kid to adult! 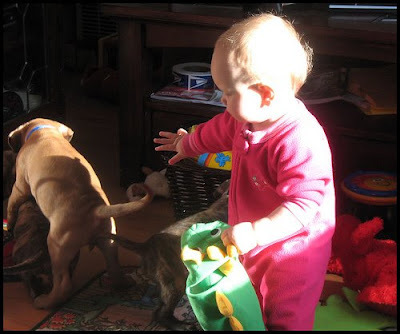 Having puppies (especially lots of them) is a lot of work and a lot of cleanup. Charlie is still too stuffy to go swim this morning, so I'll be going, then restocking our chicken soup supply and heading back home. MAYBE I'll work on my taxes (I haven't started yet). Aaaaah - it's Saturday.... and today is also the once a month 'half off all day' Saturday at Goodwill. Charlie is still stuffy but feeling better. Time to go to water aerobics, then shoppage! Maybe work on my taxes too! 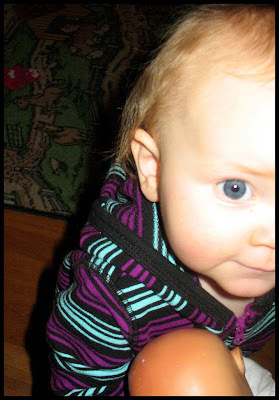 Day 1083 - Our Savi is 11 months old! 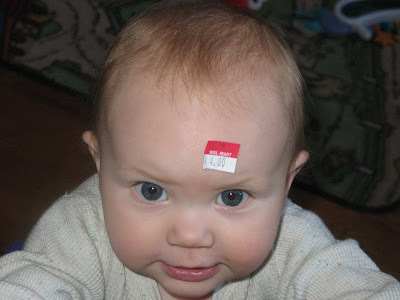 Four bucks is a great bargain - I'll take one and so will half the ladies at work! 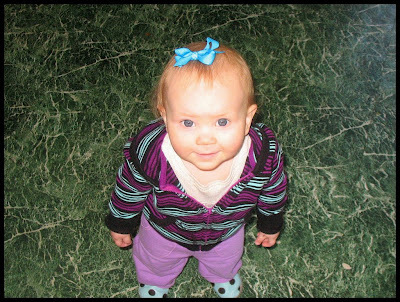 Heather, I can't believe how fast this time went by - almost one year old! Charlie has a bad head cold. Get Well, Charlie! He's been eating soup and going through boxes of tissues - 'Puffs Plus Lotion'. I restocked the supply, so he can use all he wants. Yesterday he wanted to take his temperature, but our thermometer was so old it didn't work anymore. I picked up a new, non mercury one at Wal-mart. No fever, which is a good sign. Have a great Friday and a great weekend, everyone! Happy 11 months, Savannah! I went to the health club at lunchtime yesterday to swim. First story - the pool manager was in the lifeguard stand. There isn't usually a lifeguard there at that time. The pool manager said there's a new regulation that they HAVE to have a lifeguard there when the pool is open. Gee - that will cost them a bunch! I wonder if that applies to hotel pools also? Anyway - remember that yesterday I was complaining about liking a product, then not being able to find it? WELL, I am not alone! One of the staff at the health club just 'out of the blue' started telling me a story about her grandmother (the grandmother is probably my age). Her grandmother likes to use high-heat capable non-stick cooking spray when she's cooking. Her grandmother had just ordered a case of it online, because her grocery store wasn't carrying it anymore! How relevant to yesterdays blog! 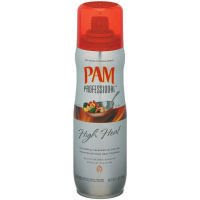 I had never heard of the stuff, but did some research and found that Pam makes one of them. I use a lot of non-stick spray, and it is true that the 'regular' kind turns brown when you use it on a really hot pan. It's in the TEENs here today and won't get up to freezing. The heat is cranking here in the house though. Here's Miss Savannah playing peek-a-boo, or peep-eye, or pee-pie, choose your terminology. You know sometimes when you like a product and you go back to the store to get more of it, and it's GONE? I did that yesterday - I went over to Costco to get some freeze dried apple chips that I like. They don't have them anymore. The same manufacturer sells some AWFUL potato chips that I DON'T like. They were still there. Hmmmm... The good news - if I really like them and can't live without them I can order a case of them from Amazon.com. The challenge - where to PUT them then? I have to declutter the house, by the way. Our Christmas tree is sitting in the 'art room', but not in a decorative way, in a 'cluttery' way. I have piles of stuff everywhere that needs to be sorted through and thrown out. The closets need to be 're-orged' as well. Sounds like a fun spring cleaning project, doesn't it? 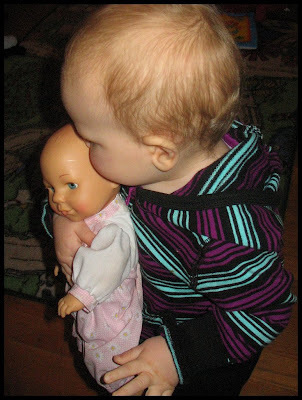 Here's little Miss Savannah, sharing her toys like a nice girl. Her hair looks long in this picture, Heather said she has an Elvis look. Too cute! So - what's going on, Dudes and Dudettes? I've assembled all my tax stuff (I think I have everything) - maybe I'll tackle it this weekend. One of my team members said her FATHER (imagine how that makes me feel) just got an EARRING - mid life crisis alert! Another of my team members (who hasn't turned 30 yet) is off to Colorado for snowboarding. I have been missing florida lately - you can read that as missing warm water and white sand beaches! We're supposed to have a chance of snow showers today - we'll see if that happens or not. I still am not sure if my CRV has ever gone into real time 4WD. Take care and have a nice Tuesday! Day 1079 - Happy Groundhog Day! Did the groundhog see his shadow today??? I haven't heard. Happy Birthday to Cheryl's husband Kerry today! 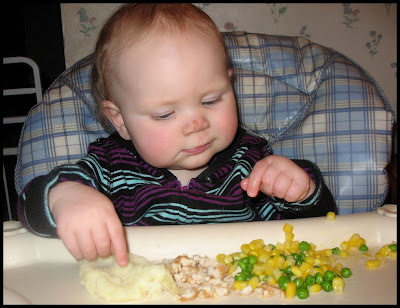 Here's an adorable photo of Savannah at 'the buffet'. She looks happy! I like the smudge of chocolate on her nose the best. What did you think of the game last night? It was a nail biter at the end, and either team could have won, but Pittsburgh made it. I cheered with everyone else when James Harrison made the 100 yard touchdown, then I was disgusted and appalled later in the game when he exhibited very cruel and unsportsmanlike conduct. They should have thrown him out of the game. Ah well - that's my rant. TTFN and have a nice Monday! Day 1078 - Go Superbowl, go! It's time for the exciting, annual hysteria known as Superbowl Sunday. And if it's not exciting, people enjoy watching the new commercials. 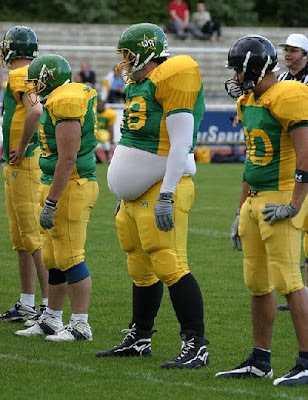 Somebody get this poor man a uniform that has coverage, would you? The photo makes me laugh out loud every time I look at it! Hilarious! Give that man a tuba, it would fit! I've spoken to more Arizona fans than Pittsburgh, but the Steelers are favored by 7 points. I'm rooting for the old guy - Kurt Warner, and Arizona. Go, Cards, Go! Charlie and I are going to go swim, then run errands, then head over to our friends TY and SY's house to watch the game. Have fun, whatever you're doing! TTFN!